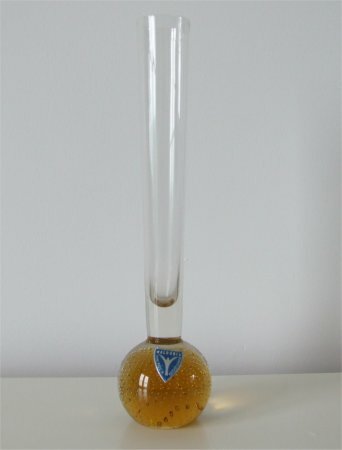 This amber based vase was found in Canada and is approximately 190mm (7 & 1/2") tall. It has small, well controlled bubbles coming up in a spiral from the base. The bottom of the base is concave. 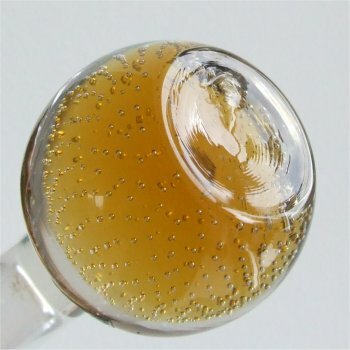 The stem is clear and has a medium flare of approximately 25mm (1 inch) across the top. 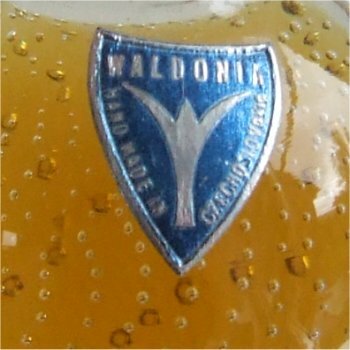 The label is a shield shape and a metalic blue colour with metalic silver writing and logo which states "WALDONIA HAND MADE IN CZECHOSLOVAKIA"
I believe Waldonia was an importer of glass in Canada. (see images below).